There are many draft breeds, most of them from the United Kingdom and Europe, though the American Cream Draft and the North American Spotted Draft were first bred in the USA. All draft breeds were originally intended for work, and used mostly in harness. Some of the lighter draft breeds also served as riding horses on farms. As technology replaced horsepower, the breeding of drafters declined in many places. Some of the European/Asian breeds are now bred primarily for meat. Many of the American and British horses became showhorses or exhibition horses. A Draft hitch is an impressive sight! Here in the USA, Budweiser still, has their famous Clydesdales, and Colonial Williamsburg is helping to boost the profile and gene pool of the American Cream Draft. These horses are actually champagne, not cream dilutes. Jolly 'Seren' resin finished by Laura Marr. (Champion Supreme Cream® x Dixie Ward [m-phf]- Rebel Dixie Lee [m-s.feld]) Dam is a Belgian, to increase the gene pool. (Creamsicle [m-k.fawcett] x Orange Cream [m-k.fawcett]-Eads King Cream ®) Bred by Karen Fawcett, mix of live and "untraced" model lines. AR SM 'Cecelia' by Sue Kern. NASD has a Premium registry for 7/8 and more Draft, and a Regular registry for at least ½ but under 7/8 Draft, and also a breeding stock division for solid colored horses of NASD breeding. We do not have Gypsy Vanners as they are a proprietary breed. (Pecos Chief [l] x Schreiber's Megan [l]- M G McKnight) Sire is the founder of the breed, dam is pure Percheron. Open Photo Show Champion, MEPSA 01 Top Ten Non-British Drafters. Sire of Abercrombie, o/b Chris Wallbruch, TFs Every Blackbird, o/b Linda Ransom and 97 foal for IPABRA auction. 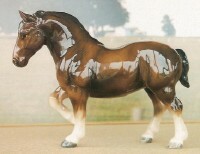 (Foxfire Robin of Loxley [m-d.metcalf] x Foxfire Morning Glory [m-d.metcalf]- Venturas Choice) Sire, Clydesdale and Paint. Most or all lines to live. Sire of Shadow Ghost, 09, o/b PHF. (Reilly's Move [m-cc] x Scotland's Pearl [m-cc]- Roswell's Scottie [l]) Sire is NA Spotted Draft, out of a live mare, W.V. Trixie. Dam is a Clydesdale with all live lines to Thombro Select King, Muirton's Castles, Solomon's Chief and Westgate Attraction. Sire of Et Tu Brute, owned by Lisa James. (Fanny's Vanity [bso-lod] 88 Angus McVane [m-phf] x Obviously A Fanny [live- Paint] x Carson's Cristal Delight [live] bay extreme sabino- Solomon's Colonel) A three-fourths Clydesdale frame overo spotted Drafter. Stone Signature series 'Skyerider' by Michelle Locke. Sire of Poison Moon, o/b Chris Wallbruch. (Galway Warrior® x BF Pippin®- Glatstopper) Out of an excellent live mare I borrowed use of. 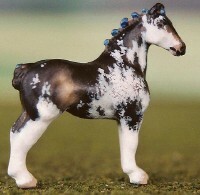 She is a beautiful bay tobiano with lots of feather. Galway Warrior was Amercia's famous, now sadly deceased. 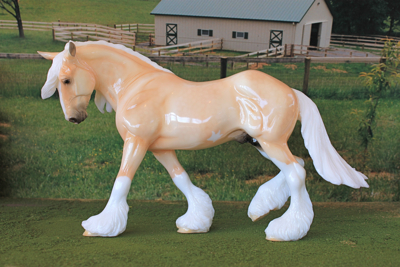 3/4 Shire Drum horse, honored by Breyer with a portrait model. 'Brave Hart' Sheryl Leisure OF resin. MEPSA Champion, multiple Champion. 2009 MEPSA Championships Reserve Champion OF China Draft/Pony breed and Top Ten color. (Galway Warrior® x Jenson Sampson Nellie® Shire- Illusion Farms Mister Sampson) Drum horse stallion, NASD. Sire of MMR Warrior's Gypsy, o/b Fatima Hammoudi. (Storm Chaser's Golden Boy [m-c.nakagawa] X Woodhouse Lucky Charm [m-c.nakagawa]- *Grayingham Lucky Lad [live]) Sire is from the only registered dilute line in the Shire breed. The Shire association now allows only mares to be bred if dilute, no stallions. So this stallion is only open to sire NASD horses and mixed Drafts. Lines to Ladbrook Invader, Ryton Majestic, Grayimgham Lucky Lad, Ryefield Select. 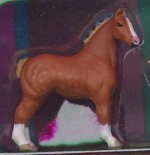 Breyer JAH SR Pamplemousse OF. 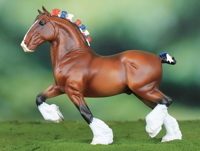 Breyer classic "B" Shire NASD 2009 only. 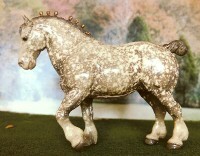 Stone trotting Drafter "grulla sabino Clydesdale" RR 1999-2000. 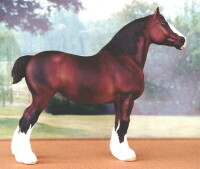 1993 dark bay sabino ½ Clydesdale, ½ Belgian mare, also NASD. (Ambrose Chapel [m-h.reaves] Clydesdale x Brookview Belle®-Belgian- Don's Jay) Lines to Hayston's Ideal, Doura Excelsior, Bardrill Castle, Paladin Farceur, Major Farceur and Victoria DuMarais. Micro CM by Janet Bonney. Dam of Shadow Ghost, 09, o/b PHF. 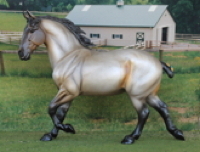 (McGrath's Beauty Joe® x Domino Koko [m-cc]- Dominos Black Deck®) Sire is Percheron, dam is half Percheron, half Paint. Dam of Almost Blue, 99, o/b Chris Wallbruch; TFs Every Blackbird, 00, o/b Linda Ransom and Angella, 01, o/b Cory Hartung. (Proud Master [m-cc] x Black Ice [m-cc]) 4/4. 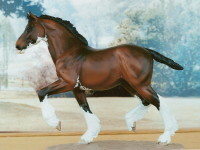 Sire is NA Spotted Drafter with all live lines, by Loud And Proud and dam is a black Percheron with "Knight" lines. Dam of Foxfire Jonicia, 99, o/b Delana Metcalf and Poison Moon, 05, o/b Chris Wallbruch. She can only produce tobiano pintos. Dam of Abigail Merel, 03, o/b Sarah Carper. JCP 2007 SR G3 SM Cob OF. Dam of MMR Warrior's Gypsy, 08, o/b Debbie Teeselink. Japan bone china mini customised by Janet Bonney. (Armon [live] ches/flax x Dolly [live]) Partial pedigree (3+/4), but parents are live. 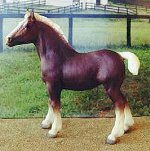 Breyer Clydesdale foal 'Satin Star' OF. 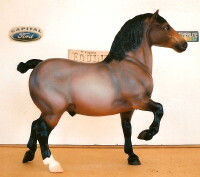 Breyer 2007 Belgian "Trait du Nord" OF. (Prince of Mischief [m-bb] rrn x Shady Lawn Lula [live]- Prince De Bruille) 4+/3 gen ped. To Champion Radalta King, Caliban and Lorjen Henri. Dam to Farceur's Major, Territt du Marais. Model and live bred. Sire of Foxfire Lady Of The Realm, o/b Delana Metcalf; Big Bella, o/b Lisa Nice; Constance, o/b Kay Myers and Dixie Henrietta. (Beltane Coronet [m-ff] x Sarrie K Farceur [live]- Colonel K Farceur) 4/4. To Conceur, Conquerais, Conqueror's Farceur, Conquest, Siehl's Tripsee Farceur. Photo Show Winner in breed & gender; placed in color & make. Sire of Foxfire Gladiator, o/b Delana Metcalf; Big Daddi, o/b Lisa Nice and TSS Max, o/b Randa Garrett. Stone 2001 Christmas ornament OF. Sire of Abigail Merel, NASD, o/b Sarah Carper and Amanda Mae, o/b PHF. (Bloom's Conquerors Sampson [l] x Dinah's Dawn [l]- Lazy P Conquerais) Traces to Constable, JJ du Marais, Conquerors Farceur and other Farceur horses and Lazy P lines. Japan OF copy of Hagen Renaker 'Sespe Violette". Sire of Oakwood Emperor, DHF Stonewall Conqueror and Matilda's Rayse The Stakes. Multiple Champion, MIJC Supreme Champion. (Foxfire Deucalion [m-d.metcalf] x Foxfire Jubilee Layne [m-d.metcalf]- Windmill Lane Joshua [m-k.myers]) Lines from Double Hart Ranch and Caballos Del Mar. (Rebel Dixie Lee [m-wmhs] x SLM Mindy Ward [m-wmhs]) 3+/3. Traces to all live horses. Penn State Conqueror, Dennis Tripsee Flash, Orndoff's Buddy. Photo show placed. Seldom shown. Dam of Dixie Henrietta, 91, o/b PHF; Center Stage, 92, o/b Heather Gnidovec; Foxfire Titan, 93, o/b Delana Metcalf and Buttercream Dixie, 94, American Cream Draft, o/b PHF. Dam of Kassandra, 99, o/b PHF and Bruton's Copper Queen, 02, o/b PHF. (Confar Mack [l] x Lemay Beaut [l]) all live lines. Dam of TS Matilda, 94, o/b Randa Garrett; Oakwood Emperor, 98, o/b Cindi Nakagawa; Matilda's Rayse The Stakes, 02, o/b Nancy Baker and Matilda's Amanda Mae, 10, o/b PHF. Multiple Champion. Regular MEPSA qualifier. Dam of DHF Stonewall Conqueror, 98, o/b Vicki Griffiths. Dam of Odin, 98 halfbred gelding, o/b PHF; 02, o/b PHF and Cosmos, 04, o/b PHF. (Neilsons Commander® x Peecos Melita®- Nelsons Sandy) Lines to Conqueror, Jay DuMarais, Consanda, Duke Farceur 2nd, Sidney Supreme. G3 SM Drafter CM by Janet Bonney. MEPSA 2009 Championships Reserve Champion CM Draft Breed, TT Gender. (Diamond S. Paul® x *La Chante d'Amor [m-phf]- Wynstorm Wolv [m-a.ingram]) black roan Belgian mare crossed on an American Belgian chestnut sabino stallion. Lines to Orndorff's Congolaise Classic, Constricto, Belgian lines. JCP 2007 SR G3 SM Drafter OF. Dam of Cachet, 10, o/b PHF. (Down Home Stalwart [m-k.bjorgo] x Oakwood Korry's Lil [m-c.nakagawa]- Korry's Captain®) Lines to *Rivaal van Terseat, Enbsor d'Elewijt, L&C Korry, Orndorff's Congolaise Supreme and Constrico. (Isadore van den Hogelberg® x Amazone van't Keerkenhof®- Ideal van St- Martens) 3/3. Live lines. 'Rasmus' Gudrun Schmitt AR by Rita Menard. Winner. Reserve Champion. 2009 MEPSA Championship AR Gender Top Ten. Sire of Foxfire Kiss My Assets, o/b Delana Metcalf and TFs Bremen King, o/b Linda Ransom. Jolly resin finished by Suzanne McAllister. (Wynstorm Wolv [m-a.ingram] bl ro x Milkwood Farm's Hilde [bso-lod]- Eros Van't Berrekenshof [l]) Sire has only 1 gen pedigree, but parents are live, and dam is a bso full sister to the dam of a good, live Brabant stallion, Milkwood's Farm Bruno. Dam also has 1 gen pedigree. Jolly Andocles resin CM by L. Kathman and finished by Suzanne McAllister. Dam of King Arthur, 01, o/b Hanna Axelsson; TFs Bremen King, 02, o/b Linda Ransom; Paul's Congo Chanteuse, 05 and SLM Voulez-Vous,07, both o/b PHF. Stone mini Xmas ornament 2001. Dam of Foxfire Kiss My Assets, 02, o/b Delana Metcalf and Guylian van den Heuval, 05, o/b Leah Breniser. Schwartzwalder Fuchs in German, they are invariably dark chestnut. (Rune (Retter(r) X Mira(r)) 1993, black chestnut x Mädchen [m-phf]- Muskat [m-h.reaves]) Lines to Reith-Nero, Mittler, Diktator, Merkur. Do not breed to his dam, below. 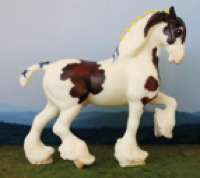 Breyer vintage glossy wild dapple Clydesdale stallion OF. MEPSA qualified in mold classes. Dam of Faucon de Roche, 89, o/b Crissi Goreham. Japan copy of HR Crusader. Dam of Maedros, 98, o/b Erin Carter. (Blue Print Glen Argyll® x Donnas Perfect Lady®- Pioneer Final Command) Traces to Dunsyre Footprint, Doura Perfection through Doura Ambassador, Muirton Masterpiece, Lucy Argyll, Belleau Final Command, Scotlands Pioneer. Sire of Lachlan McVane, o/b Amber Berdie and Lucinda, o/b Beata Parsons. (Ridgedale Prince [live] x Monarch's Highland Heather [live]- Meadowview King) 3/3. New pedigree- all live lines. To Doura Excelsior, Belleau Monarch. Sire of Thunder Glen Crispin, o/b Sherry Ball and Woodland's Commander In Chief, o/b PHF. 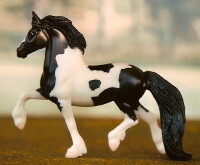 Breyer classic Shire OF from wagon set. (Mahdeen O'Danny Boy® x Brunt-Hill Ginger®- Doura Sir James) Great lines: Quaker Ambassador, Ayton Perfection, Bardrill Enterprise. 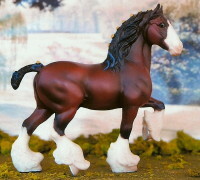 Breyer factory custom classic Shire from wagon set. Shannondell loose mane version Premier 2016. (Maplewood Levi [live] x Zodiac Lady [m-oma]- Paddock Gemini [m-lvh] ) Lines to Nothing By Chance, Pull Force, King. Dam is model bred. 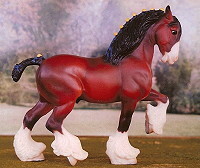 Breyer Clydesdale mare 'Dempsey' OF. Photo show winner, IPABRA 2001 Nat'l Champion OF Dam. Dam of Erin McVane, 99, and Mosby, 05, both o/b PHF. (Dunelm Rhu [m-k.myers] x Footprint Princess Royal [m-k.myers]- Doura Black Prince) All lines to live, includes Solomon's Commander, Broadlea Classic Perfection, Doura Secirity, Doura Magnificent, Classic Laddie. Franklin Mint small Clydesdale mare with foal. Dam of Royal Wreath Of Flowers, MEPSA winner, 00, o/b PHF. (Angus McVane [m-phf] x Lady Maybelle [m-phf]- Maplewood Levi [®]). Stone 2nd 1/2 year 'Juli-Ette' OF. Dam of Coventry Ardor, 08, o/b PHF; Coventry Cloverdell, 16, o/b PHF and Coventry Kenzie, 10, o/b PHF. (Tapageur® x Manolita®- Ibis) Live lines. (Egyptien [live] x Sauterelle P [live]- Manhatten) 2/1+. Live lines. (Nemo® x Rachelle®-) Live lines. Not much pedigree, though. 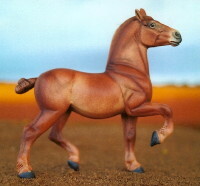 Breyer G1 SM Drafter QVC SR OF. (Esperanto® x Blond®- Under) Limited pedigree. 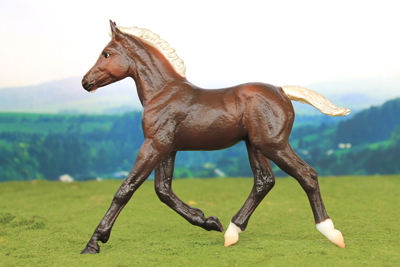 Breyer QVC 'Wixom' SR .
(Aulum Model® x Monique®- Movistar) All to live Jutland horses. (Ashes An Soot [m-wwndf] x Kobold [m-wwndf]- Norman [l]) 2/2 Only a two generation pedigree, but all grandparents are live. BSO at this time. Was a Mini Whinny OF until I found out Norikers are never given short tails. 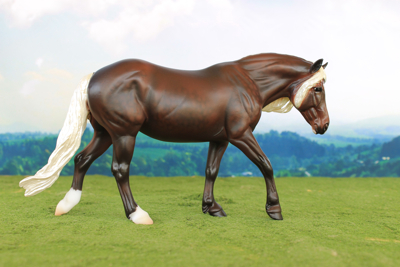 Best known lines for chestnut Percherons and the recessive gene are; Highview Dragano, M.G's Prince, Blue Ribbon Farms Hercules, A large number of Justamere Showtime horses, and Dragano son's and daughters. Even South Valley Did-It himself was a red carrier. They are out there, and a number of black Percherons do carry the chestnut gene.